SBradlee: Ana, thank you so much for inviting me. I really appreciate it. SBradlee: I guess as a writer I am a bit unique. Although I have been writing for most of my life, outside of magazine articles, I have never published under my own name, including Falling In Love. I am using a pen name partly to help hide Sherry’s identity. Besides writing, I love—surprise, surprise—reading, as well as sports, traveling and mostly enjoying life with my wife, our daughter and our dog. SBradlee: Strangely enough, it was my first Hardy Boys mystery when I was really young. I ended up reading the entire series in a very short time. Those books first taught me about plotting because every chapter ended with a cliffhanger, and that was really the beginning of learning to write suspense. SBradlee: I’ve wanted to be a writer for as long as I can remember. I wrote my first book when I was four before I had learned any written words. It was really a comic book about my cat and I hunting for a mouse and when we found one, I wouldn’t let her kill it. It was based on a true story. SBradlee: I guess two things. One is to write the book that you would love to read. If you write it well hopefully enough readers will also love it enough to make you relatively successful. If not, you know that you will always have one very loyal fan. Secondly, believe in your ability to create something special. Writing can be so difficult and writers can be so insecure about their work and so afraid of exposing their most intimate thoughts and feelings that the writing itself can become intimidating. You have to believe that in the end it will not only be worth it but that you will give something to the world that no one else can. Ana: I absolutely loved Falling In Love, but let’s pretend I have no idea what it’s about, can you tell us a little bit about it? SBradlee: Well, the book is based on the true story of a young women’s battle to overcome sexual addiction. I didn’t really want to call it Falling In Love because to me the title shouts “romantic comedy.” But there is a line in the book about her falling in love every weekend, and Sherry’s life really was a series of falling in love. And falling. And falling. In the end, she has to do the hardest thing for her, to find self-love. Ana: Falling In Love is a based on a true story, is it easier or harder to write a story that stems from someone’s life? SBradlee: I think it is probably easier because the true story is at least some version of a first draft. But then you have to be true to that story and to the person it is about and that can become very difficult. Ana: What was the hardest part about writing Falling In Love? SBradlee: Sherry wanted to tell her story but she also wanted to remain anonymous. So I had to change some of the events in the book but still keep the emotional impact of the original events. That was much harder than I had imagined it would be. Ana: At the end of Falling In Love there’s a hint at a sequel, is there another book in the works for Sherry? SBradlee: I would love to do a sequel to Falling In Love but it is really up to Sherry. I’m like a lot of readers of the book. I’d love to know what happens next. Ana: Your bio says you’ve worked as a script doctor, can we probe a bit and find out which scripts you’ve worked on? SBradlee: I’m sorry Ana, but I don’t think I can say anything. For most of the films, contractually, I’m not allowed to say that I worked on them. Under my real name there are rumors about what films I’ve worked on and most of the rumors are true. But because I’m writing under a pen name I am hesitant to mention anything that might reveal my identity. I know this is a lousy answer and I apologize for that. SBradlee: Absolutely! I’d love to spend every day at the beach with an umbrella drink in one hand and a book in the other. SBradlee: The pleasure is all mine. Thank you so much. 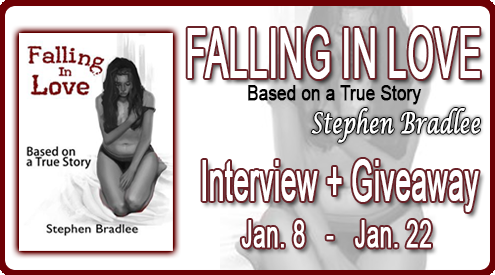 Concluding our chat Stephen is giving away an eBook copy of Falling In Love. But WAIT, there's more! For every 50 likes on Amazon, Stephen is going to be giving away another eBook copy of Falling In Love. Yepp, more chances to win this amazing book and a chance for you to read Sherry's story. There are currently 8 likes on Amazon, so we will be starting there. 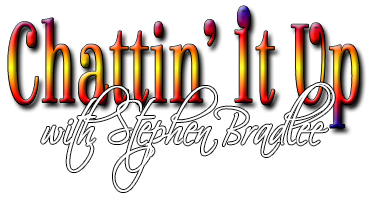 Stephen Bradlee is the pen name for a Hollywood film executive. He has ghostwritten celebrity autobiographies and has worked as a script doctor. He is married and lives with his wife, their daughter and their dog. Loved the interview. Falling in Love sounds pretty interesting. Just added it to my TBR, can't wait to read it. Being a script doctor sounds like it would be interesting, I bet it has helped with writing a novel. sounds like a really interesting read & I love stories based on true events...looking forward to the read! Very nice interview :) I've got this one on the review pile and am looking forward to checking it out even more now. I don't think I've read anything even remotely similar.